With the advent of AI and Blockchain technology and its exponential impact on business, a recently released open-source project SingularityNET https://singularitynet.io/ is truly revolutionary by combining both technologies into a decentralized market of coordinated AI services being backed by Blockchain’s smart contracts. Within the SingularityNET platform, the benefits of AI become a global commons infrastructure for the benefit of all; anyone can access AI tech or become a stakeholder in its development. Anyone can add an AI/machine learning service to SingularityNET for use by the network, and receive network payment tokens in exchange. Today, the only technical information is available through their white paper (Dec 19, 2017) at https://public.singularitynet.io/whitepaper.pdf that gives a glimpse into their technical details. After struggling for a few days, I discovered an approach to consume their technical information by hacking with the SingularityNET source code. This article summarizes how to implement an AI service provider integration with SingularityNET’s service wrapper API. 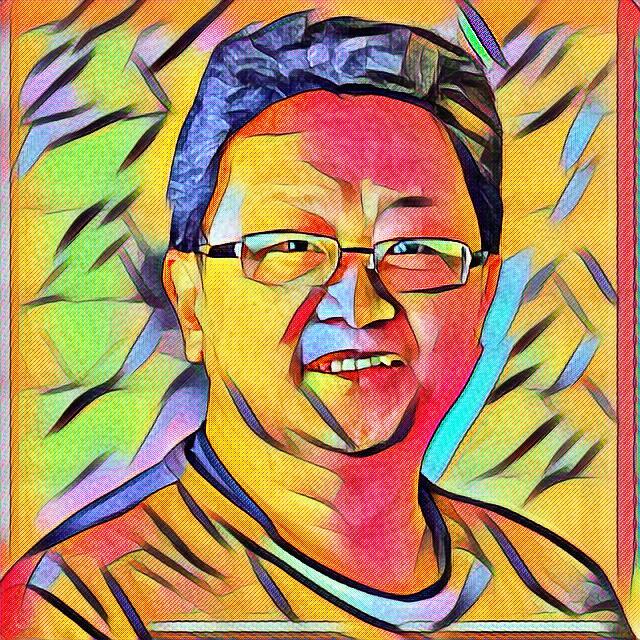 The example AI service is using MNIST image classification implemented in Tensorflow. Figure. 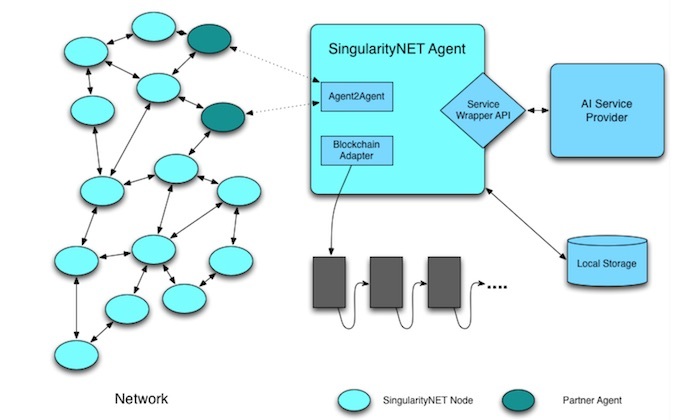 SingularityNET high-level system architecture, which illustrates how the platform supports AI agent to agent interactions and uses Blockchain smart contract to record the transactions. Obviously, there are many more SingularityNET topics, which must be explored by other articles. SingularityNET is moving forward with another alpha release. This article is out-dated as of 2018-05-03; however the information can still be useful to understand the functional and implementational views of cooperating AI agents. For the latest SingularityNET development, reader can refer to Wiki at <https://github.com/singnet/wiki/wiki>. Virtual environments make it easy to separate different projects and avoid problems with different dependencies and version requirements across components. In the terminal client enter the following where envname is the name you want to call your environment, and replace x.x with the Python version you wish to use. From this point forward, we shall use the singnet as our environment name. To activate or switch into your virtual environment, simply type singnet is the name you gave to your environment at creation. After checking out, the article assumes the code is located in singnet directory. There is a long list of installations. Life seems good that every requirements are installed without hipcup, which is a rare event in a hacking experience. According to the SingularityNET official website, SingularityNET runs on Mac OS X, or any Linux which has Python 3 installed and Docker or Docker for Mac installed. Their core devs regularly develop on Mac OS X Sierra, Linux Mint Mate 18.2, and Linux Ubuntu 16.04 LTS among others. Docker and Docker Compose are used heavily, so you must have a recent version of Docker installed to take advantage of most of the automation and to isolate yourself from the dependency hell which often results from installing software with complex dependencies directly onto your host development OS. The current development demo runs from a dev docker container which can be launched from your favorite bash terminal using the helper tool shell script: singnet/tools.sh. Brings up the Dev server to demonstrate many agents interaction. 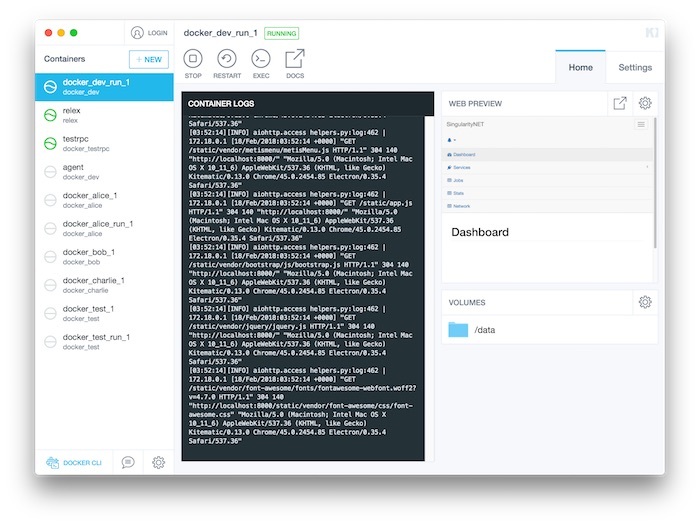 You can view the SingularityNET docker containers, are running as illustrated from Docker’s Kitematic UI. You can open browser at http://localhost:8000 for interactions. To gain deeper insights, we can inspect the network traffic using Chrome Developer Tools. You need to reload the page with the network tab open and filter by type ‘All’. This will show you a connection being made with a network calls. You can then click on the connection to show the traffic being sent back and forth to the server. Figure. 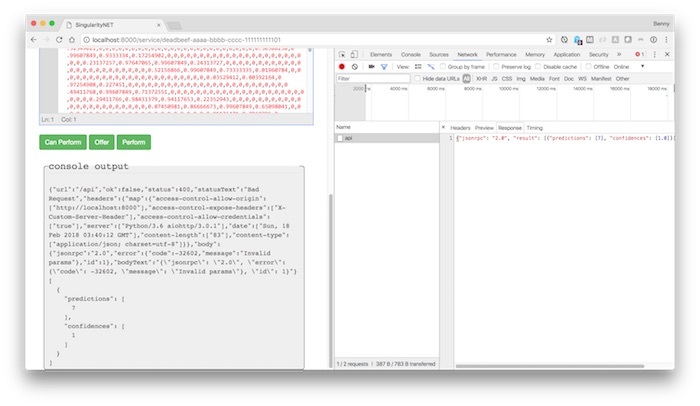 The Chrome developer tool showing the request data. After clicking on the [Preform] button on the UI, the MNIST request is sent with the image data. The MNIST image data is a 784 (28x28) vector of pixels. The prediction response can be viewed on the UI and from the Chrome network inspection tool. Figure. The Chrome developer tool showing the response result. The prediction result is a 7 with the perfect confidence of 1 that it believed that a number seven has been seen. There are three fairly common methods on the service adapter abstract base class, where you might want __init__ to initialize member variables, post_load_initialize to ensure all of the dependence services have been loaded and finally perform to execute the AI business logics to provide result from a request. Let’s take a look at the service adapter member variables. This is important to remember listing all the dependent services here. If the requirements are met, then the variable requirements_met will set to be True. The unavailable flag defines whether the particular service is currently up or not. This available flag is used by the rest of the system to manage things automatically. This is the service adapter base, all other service adapters are based on it. The post_load_initialize is recursively calls all of the required service post node to initialize. If a service that relies on three or four other services, they’ll get loaded together and initialized together. There are start and stop functions where you can take a service online and offline. The can_perform function is used to save cost on the network because you can directly ask the agent if it can perform something before you a request that is going to involve a blockchain contract and potentially some gas costs charged. This is a boolean flag indicating if this worker can do whatever work it says it can. An answer of no can be because it is offline, or perhaps it is too busy. The perform function is where the bulk of the work gets done. 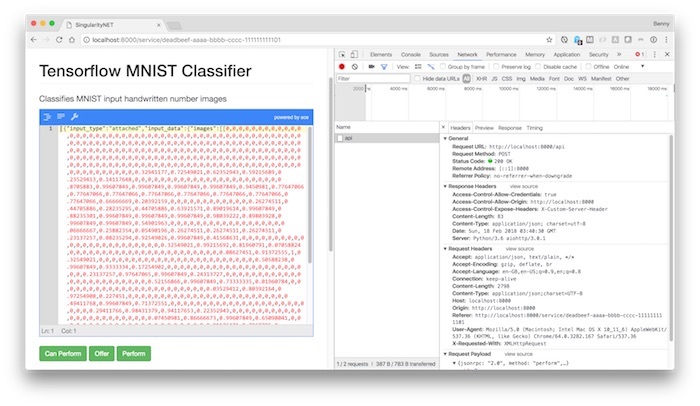 Let’s go to take a look into MNIST classifier for the details. MNIST service adapter doesn’t really do anything except for checking the classifier ID in the initialization. In the post_load_initilize, we do the bulk of the training and loading of the model for the classifier. The details of post_load_initilize will not be described. We need to put references to the input images and the classifier graph itself. There are few checking to see if the path exists and loading the model. # Train the model or load a pretrained model from the cache. The bulk of the work is being done in perform. We start a session to restore the model. Then we go one by one through each of the job items in the job. We take the inputs and pull them out of the data that was supplied by the request. We do some sanity checking on the types and then we run the actual classifier. Finally, we pull the confidence out so that the prediction can associate with the confidence value, sending out in the results. # many different images. Each item, in turn, may be an array of images. # Get the images to classify, while making sure our job item dict is of the appropriate format. # Add the job results to our combined results array for all job items. In the singnet/agent/dev_config.yml file, we have to define the TensorflowMNIST service with a good unique identifier deadbeef-aaaa-bbbb-cccc-111111111101 and the module that is loaded adatper.tensorflow.mnist.TensorflowMNIST class. Ideally, this agent integration example warms up your curiosity on SingularityNET platform, to prepare for the ultimate SingularityNET’s AI + Blockchain development.